What are Floating Hardwood Floors? Most floating hardwood floors are made with engineered flooring material. This is true 99.9% of the time. Typically, a finished hardwood layer is glued on top of wood or multiple ply layers. These layers are glued together to form the part of the board that you do not see. Floating hardwood floors are long lasting. They typically last at least 50 years and can last upwards of 100 years depending on foot traffic and care. Many types can be sanded two or three times during there life! This greatly increases the life of these floors in itself. Why are they called “floating” hardwood floors? Why Choose Floating Hardwood Floors? In a word, Moisture! 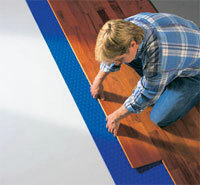 Moisture is the most common reason for choosing this style of flooring. The main benefit for choosing floating hardwood floors is to keep control over the expansion and contraction of your flooring. Therefore, floating hardwood floors are often installed in humid areas. Wood Floors contract and expand with moisture changes. Basements and moisture rich rooms can cause problems for floors. Also, geographical areas with high humidity levels are sure to cause more expansion and contraction in flooring than dryer places. If you live in a sultry area of the country installing floating hardwood floors may be right for you. Normal hardwood floors may separate. In time, the gaps between boards get larger and more noticeable. This is very undesirable. A typical hardwood floor will contract and expand much more than the engineered flooring that is used in floating hardwood floor installation. In addition, there are other reasons that could make floating hardwood material a good choice for you. Perhaps it would take too much time and money to tear up the existing flooring. Removing a tile floor or a floor with asbestos could be a huge project. Installing floating hardwood floors over the existing floors is often a cost effective method of changing the flooring without getting into the expense of a demolition project.